The MORryde UO21-003 X Factor is a performance crossmember that is the latest product in the MORryde line of suspension systems and aftermarket products. The X Factor crossmember is designed to provide added lateral support to fifth wheel and travel trailer frames. Kit Included: (1) adjustable crossmember, (2) clamp straps, (2) wet bolts & flange locknuts, (8) 5/16-18 x 1 1/2 HHCS & locknuts, (4) 3/8-16 x 1 flange bolts & locknuts and Manual. 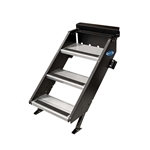 MORryde CTG60-2048W Sliding Cargo Tray - 20" x 48" MORryde UO21-003 X Factor Performance Cross Member - (SRE, CRE And Other Equalizers) MORryde SP54-099 Lockable RV Step Storage Box MORryde CTG60-2090W Sliding Cargo Tray - 20" x 90"
MORryde CTG60-2960W Sliding Cargo Tray - 29" x 60" MORryde STP-3-27-05H StepAbove 3-Step RV Entry Steps - 26" to 28" Door Width MORryde CTG60-4272W Sliding Cargo Tray - 42" x 72" MORryde CTG60-3990W Sliding Cargo Tray - 39" x 90"
MORryde STP-4-27-05H StepAbove 4-Step RV Entry Step - 26" to 28" Door Width MORryde CTG60-4290W Sliding Cargo Tray - 42" x 90"